Unisex smart band, smartwatch. Multiple colour combinations. Can be pad printed on bottom of screen. 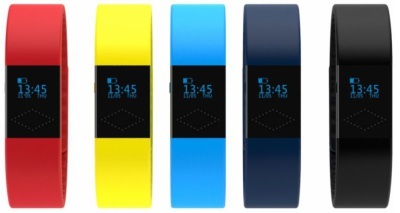 Bluetooth 4.0, pedometer, tracks steps, burned calories, smart clock, caller and message alert, shows notifications. Anti lost, stopwatch and sleep monitor. Compatible with Apple IOS and Android operating systems. Available in blue, red, yellow, navy and black.